Would you like to floor your home or business with timeless elegance that is always in fashion? Then, choose hardwood flooring from our local store. We join with 500 other stores across the country to buy hardwood and all of our flooring. That is why we can offer you cost-effective hardwood flooring prices and extensive selections. This flooring choice offers countless decorating options for your home or place of business. Select the species, appearance, gloss, and grain. Whatever your selections, feel confident that hardwood flooring installation greatly increases the appeal and value of your home. Count on the professionals at our reputable store to provide you with extraordinary value in hardwood. We pride ourselves on offering you the most popular brands from prestigious manufacturers. Besides the name, our brands offer quality, style, and many versatile options for your hardwood floor installation. Begin your shopping experience with us and we make it enjoyable and exciting. Our design and sales professionals possess the training and flair to help you choose the species and gloss that looks best in your family room. Plus, these professionals know the brands and product features and are here to help you make ideal choices in selecting solid hardwood flooring for your home or business. Our local store offers complete flooring services – from design and sales help to professional installation. After you have decided on a hardwood floor that you love, let us ensure a long life with your new flooring by sending experts to your home. These professionals have the training and experience you can count on for a successful installation. The process begins by sending the wood planks to your home three days before your scheduled installation. This allows the wood to breathe and adjust to the level of humidity in your home. Then, these technicians arrive promptly on the schedule day to remove the old flooring, prep the subfloor, and meticulously lay the planks. They work to ensure each plank is secure and level so that it does not slip or shift, making it vulnerable to cracking and splitting. They also allow a little bit of space at the outermost edges of the flooring, giving just enough room for the wood to expand and contract. Taking the time to do the job right means that your hardwood looks stunning for generations. When most people think of hardwood floors, solid wood is what comes to mind. This is the high end of wood flooring, as each plank is milled from a single piece of the hardwood species of your choice. 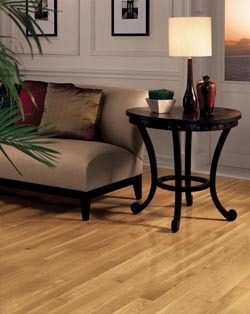 Solid hardwood is flooring that offers enduring beauty as you can refinish the planks when they become worn. In fact, you can sand and finish solid wood floors several times over the course of the floor’s lifespan, which can be as great as 100 years. Another wood option we provide our customers is engineered wood. This flooring has a veneer of the wood species of your choosing on top, with layers of high-density fiberboard underneath. Engineered wood flooring is versatile as you can install it even in rooms with high levels of moisture. Contact us today to choose your favorite wood species for your new flooring. We proudly serve residential and commercial customers in Valrico, South Brandon, Fish Hawk, Riverview, New Tampa, and Apollo Beach, FL.